room to grow: Need a Boost? Being green... I'm a pretty big fan of the concept. I think it's important to save the environment and pursue eco-friendly options. But, it can seem like so much work as everything in your life becomes compartmentalized while you try to recycle and compost. It's so much easier to just throw everything into one common waste bin, but I think of my daughter's future, and hope that small eco-friendly changes will be enough to give her a better world to grow up in. 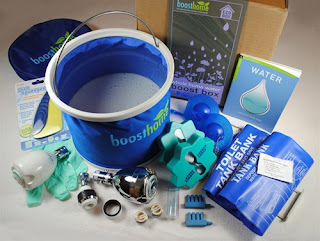 So, for all the eco-friendly slackers out there- myself included- here's a site to check out: BoostHome Products. 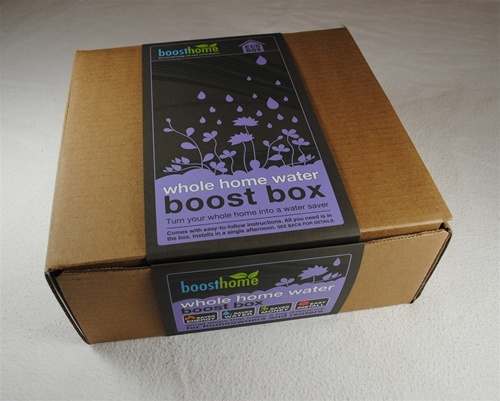 From BoostHome you can purcahses Boost Boxes- which include simple, easy to use products that can help you conserve energy in your home. The upgrades are basic, and boxes are themed according to areas of the home (ex toilet, shower, doors and windows), or you can build your own box. The box will literally pay for itself in savings in your wallet and for the environment- for example: the Toilet Boost box runs at $29.99- but will save you over 10,000 gallons of water every year! And, it only takes an hour or less to install the items in the box, and there are no tools required- genius! We've been putting off purchasing CFL light bulbs over the past few years, based on the high mercury content in the bulbs. But, the Kids Room Boost Box comes with CFLs that, if shattered, have a protective casing that will prevent mercury from escaping. I'm not sure if I'm in the market for a Boost Box just yet, but the concept is great, and maybe we can all make a difference- one small change at a time.